The Kroger Mega event that started this week has so many unadvertised deals in it! I’m still entering over 430+ items I found. 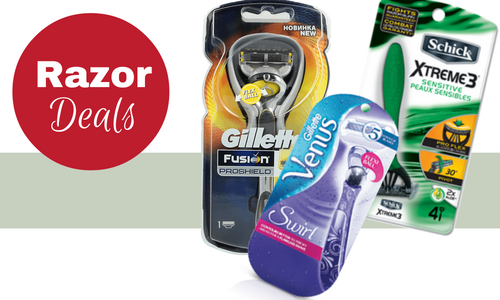 One section of the store that has some great deals is razors, shave gel and refill blades. Thanks to Mega Event discount and really high value coupons you can get stocked on razors for all of 2017 at over 70% off the regular prices! With the mega event you need to buy 4 participating items. You’ll save $4 instantly for every 4 mega event items you buy. The prices below already have the mega event factored in. See all the participating items in the sale. Note: All of the high value coupons are set to come down Saturday night!! Print them now and you’ll have 30 more days to use them.